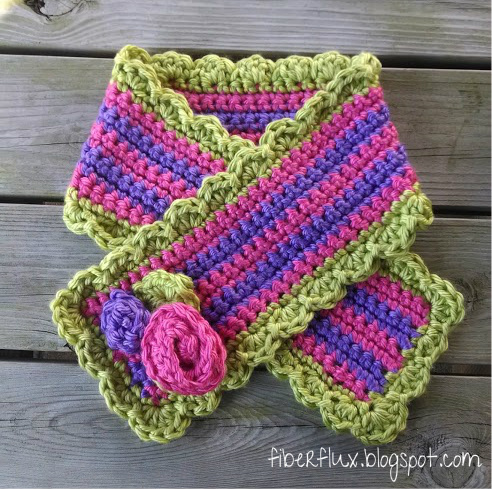 Fiber Flux: Free Crochet Pattern...Little Miss Flower Scarf! Free Crochet Pattern...Little Miss Flower Scarf! The Little Miss Flower Scarf is a happy and colorful scarf to make for your little flower. Whimsical stripes are crocheted lengthwise and edged with a lovely scallop. A cluster of roses and a leaf finishes off the scarf for an added touch of fun. Note: Each color stripe is made of two rows. Foundation (Color A): Make a chain as long as you'd like your scarf to be. In the second chain from the hook, work a sc. Work a sc in each ch to the end of the row. Row 1 (Color A): Ch 1 and turn. Sc in first st and in each st to the end of the row. Switch colors to color B and repeat row 1 two more times. Keep alternating colors A and B, working two rows for each color stripe. Scarf shown has five color stripes, with each stripe having two rows. However, if you'd like your scarf wider, simply work more rows making sure that each stripe is two rows. Fasten off and weave in any ends that remain. Round 1: Tie on yarn for edging (color C) in one of the corners. Work a sc in each stitch all the way around the scarf. Join with a sl st to close. Note: On each end of the scarf, I worked each single crochet in the spaces (versus stitches) because the scarf was worked lengthwise. Round 2: Beginning in one of the corners (if you are not in a corner when you finish round 1, just slip stitch over to a corner). Ch 3, then work 4 dc all in the same st. Work a sl st in the next st, then skip the next st. In the next st, work 3 dc. Continue in this sequence, working a sl st, then skipping the next st, then 3 dc in the next st (except at each corner, work 5 dc) At the end of the round, on the last stitch you work, work a slip st in the same st to finish off that last scallop. Fasten off and weave in any ends. With color A, ch 14. Work a dc in the 4th ch from the hook, then 2 more dc in the same ch. Work 3 dc in each ch to the end of the row. With color B, ch 8. Work a dc in the 4th ch from the hook, then 2 more dc in the same ch. Work 3 dc in each ch to the end of the row. 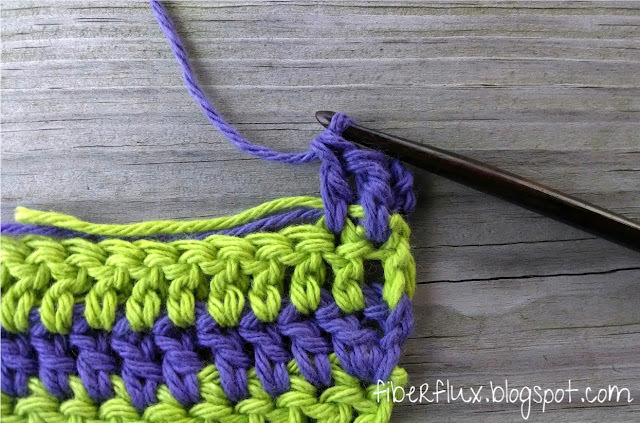 With color C, ch 4 and join with a slip stitch to form a ring. Coil roses and using ends, stitch roses together with tapestry/yarn needle. Attach roses and leaf to scarf as shown using remaining ends to attach them securely to the scarf. Weave in any ends that remain. I have made one of your crochet patterns, Jennifer. It curves, but I love it. Will try to send you a picture. And I am in the process of making the Vanilla Bean scarf....in variegated tropical colors. It's beautiful. In fact, I was complemented on it yesterday by another girl who was leaving her class while I was waiting on my class. Will try to send you a picture when it's finished. Thank you for sharing. My mom and I love your work. Great colors! I love LB's Hometown USA because it works up quick and the colors are really eye-catching. How many chains you do for yours?